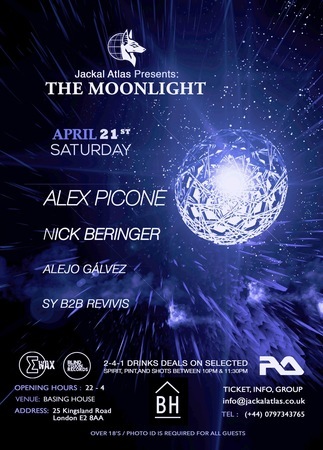 Jackal Atlas Presents: The Moonlight after Party at Basing House on Saturday 21st April. Alex Picone (Seekers), Nick Beringer (Rubisco ), Alejo Galvez (Blind vision Records), SY (EWAX) and Revivis on Saturday 21st April at Basing House. Kidnapping the hottest and hippest House DJ’s from the ether and forcing them to play their inner most captivating brand of DJing this galaxy will experience. Expect the depths of your soul to be bent into shapes of prism like proportions and wriggle down to your human appendages, swaying to colourful rhythmic grooves and booty beats of Deep House, House, Nu Disco and Dirty Tech Breaks while sipping on orgie-anic taste bud tingling cocktails with next level vibes and fulfilling human connections. Catch this experience on Saturday 21st of April of at Basing House with headlining of Alex Picone & Nick Beringer. Expect this unique, energetic duo to really step up in the months to come. Expect a night of gyrating sexiness with drink promos to boot and LED love! Check our Facebook page for free track downloads from our hot DJ line up. Venue Details: Basing House, 25 Kingsland Road, Shoreditch, London E2 8AA, United Kingdom. Price: The Moonlight – GBP 5.